Weekends already here and definitely it’s the time for a new blogpost. I have this habit of setting some goals for myself in the starting of every week and if I could check them all off, I try to present myself with small gifts( be it a favorite dessert, an outfit or a new accessory). I have been doing this since a long time now and this has helped me to start my week with a very positive note and end my week with a shot of excitement. Now going back to the blogpost, as my title says definitely Summer is my current State of Mind. The days have been quite warm over a couple of weeks, even though I sometimes complain about how harsh the Sun is, I am enjoying most of my evenings after work. I get to do a lot of things which are not quite possible to do all round the year. I get to sit in my Patio sipping my cup of coffee every day in the morning and in the evening. I get to take a walk around my community and enjoy the fresh air outside. I get to eat all my favorite Gelato and Ice cream whenever I feel like. I get to wear my favorite dresses and foot wear for the season, and take pretty pictures outside without trembling with cold :P. All these pretty little things aren’t possible all round the year and they definitely make me feel overwhelmed with joy. 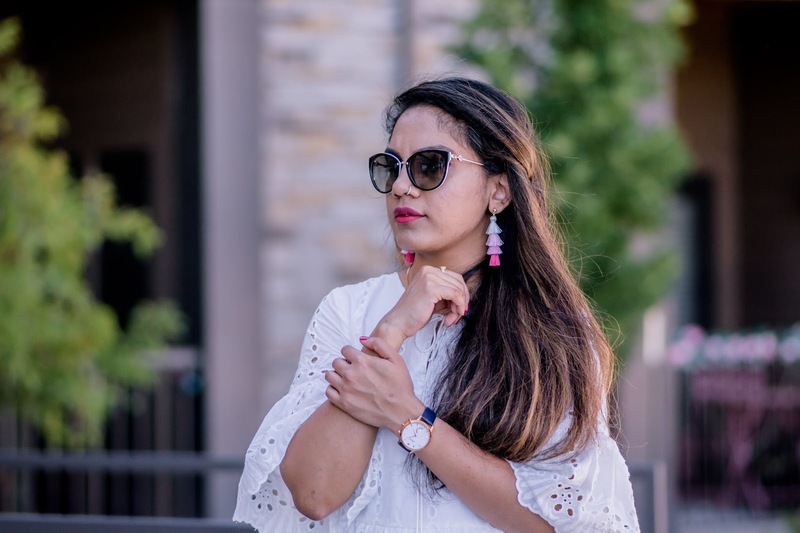 Talking about one of such days, I wore this breezy little white dress for a weekend outing. If you don’t know already white is my favorite color and summer isn’t really done for me without a new white outfit. I was super excited to wear this dress as soon as it arrived because of every little detail it has whether it’s about the eyelet pattern, the statement sleeves, the quality of the fabric or the overall look. This dress is definitely a little loose on me, but considering the warm temperatures outside I’d say its absolutely comfortable and flowy. To maintain the overall tone, I paired this look with my new favorite block heels and tassel earrings. Let me know your thoughts on this look and also your favorite thing about Summers in the comments section. Wish you all a great weekend and don’t forget to scroll down for more pictures.